Is intermittent dieting the better form of dieting? Results are promising, but far from conclusive – even in 2018. Check out the latest study in Obesity and selected research from ’18, now! Let’s get this straight, right away. The lion’s share of the currently available literature on intermittent fasting vs. continuous dietary restriction suggests that “[i]ntermittent energy restriction [is] comparable to continuous energy restriction for short-term weight loss in overweight and obese adults” (Harris 2018). And yes, there are numerous studies suggesting that intermittent (IER) is even superior to regular, continuous energy restriction (CER). However, with the plethora of different regimen and other essential differences in study design, such as subject characteristics, the in-/exclusion of exercise, or the nutritional composition of the diets the existing evidence is yet so heterogeneous that a general statement about the comparative efficacy of intermittent vs. continuous dietary restrictions seems unwarranted. And guess what, with their results, the researchers from the Adelaide Medical School are in good company. Only recently, Antoni et al. identified potentially life-saving differences in the effects of intermittent vs. continuous dietary restrictions. In their study, the scientists from the University of Surrey, observed significantly more pronounced improvements in blood pressure, as well as the postprandial C-peptide (part of the glucose metabolism) and triacylglycerol response in the IF group who dieted for only 2/7 days of the week (Antoni 2018a). Is refeeding “intermittent fasting”? With no clear-cut definition of what constitutes an intermittent fasting regimen, it makes sense to include the results of a recent review in “Obesity Reviews” in this research update. In the eponymous paper, the authors outline a “[r]ationale for novel intermittent dieting strategies to attenuate adaptive responses to energy restriction” (Sainsbury 2018) and report that of the five randomized controlled trials in adults with overweight or obesity that have tested the effects of “refeeding” (=energy balance or absence of energy restriction), two reported greater weight loss than CER, whereas three reported similar weight loss between interventions. Figure 1: Markers of postprandial lipid (left) and glucose metabolism before and after 5 % weight loss via intermittent energy restriction (IER, black circles) and continuous energy restriction (CER, black squares) in Antoni 2018. Researchers from the same group have also been able to show that time-restricted feeding aka “intermittent fasting” (feeding window ≥3 h reduced vs. baseline) triggers significant reductions in energy intake in overweight subjects on an ad-libitum (=eat as much as you want) diet (Antoni 2018b). On the other hand, studies like Schübel et al. (2018) failed to demonstrate significant inter-group differences between continuous and intermittent dietary restriction in their recent 50-week-study (Schübel 2018). Others even report that “in normal-weight subjects have shown detrimental effects of intermittent diets on fat distribution and metabolic homeostasis, raising safety concerns and the need for further investigation” (Brinia 2018). Moreover, another 1-year study found that subjects in the IF group reported greater hunger – that’s in contrast to the general consensus among practitioners, but it’s what Sundfør et al. report in their recent paper in NMCD (2018). Table 1: As a review of Ganesan et al. (2018) illustrates, “intermittent fasting” can be effective in form of various regimens. There are multiple ways to shed that body fat w/ intermittent fasting: As the tabular overview on the left goes to show you, the studies in Ganesan et al’s (2018) review of studies showing statistically highly significant reductions in body fat (p < 0.01) used very different iterations of an “intermittent fasting”-diet, ranging from alternative day fasting to refeeding. Noteworthy: The alternative day fasting studies were conducted in normal-weight individuals who likewise saw improvements in their body composition. But how exactly did that work? Well, on fed days, IF70 participants were provided with ~100% and IF100 with ~145% of energy requirements. As previously pointed out, the diets were matched for macronutrient composition (35% fat, 15% protein, 50% carbohydrate). How adherent the subjects actually were, though, is difficult to tell, even though the scientists delivered free foods every 2 weeks to their home – I mean, the “few” cookies at the office and the White Hot Chocolate (worth 590kcal) from Starbucks can easily ruin any dieting effort without appearing on ashamed subjects’ 7-day food logs. In view of the fact that this is not an IF-specific problem, though, it raises no general doubts about the most relevant results in Figure 3: the subjects on the F70 protocol displayed greater reductions in weight and fat mass. The lean mass issue: an intermittent fasting specific problem? In that, we cannot ignore, though, that the IF70 subjects also recorded the greatest reduction in fat-free mass (=muscle + organs). With ~1.4kg FFM per 4kg FM, the fat-to-organ (including muscle) weight loss ratio was yet worse than the one in the DR70 group, i.e. those subjects who cut their calories by 30% every day (35% in F70 vs. 20% in DR70) – a lean mass sparing effect as it was reported by Varady et al. in both 2009 and 2013. In fact, a recent effort to pool and compare the data on IER and CER for a meta-analysis by Harris et al. (2018) found no difference in muscle and a significantly higher reduction in waist circumference (-2.14 cm | p = 0.002) and fat mass (-1.38kg | p = 0.014) – with only six studies and the previously described methodological heterogeneity in study design it would yet be premature to subscribe to any claims about the fat loss specificity of either form of dieting (see Figure 4). Figure 5: Changes in markers of insulin sensitivity and biochemical markers following 8 weeks of intermittent or continuous intake at 70% and 100% of daily energy requirements. (A) Change in insulin sensitivity as assessed by hyperinsulinemic-euglycemic clamp; completers analysis (DR70 n = 22; IF70 n = 18; IF100 n = 19; C n = 10); (B) change in fasting blood glucose; (C) change in fasting insulin; (D) change in HOMA-IR; (E) change in nonesterified fatty acids (NEFA); (F) change in aspartate transaminase; (G) change in fibroblast growth factor-21; (H) change in beta-hydroxybutyrate. Data are shown as mean ± SEM. Filled bars: change from baseline to fed visit; open bars: change from baseline to fasted visit. Pairwise comparisons: *P < 0.05 vs. C; ^P < 0.05 vs. IF100; ‡P < 0.05 vs. DR70 (Hutchison 2018). as well as reductions in total and LDL cholesterol and triglycerides were observed only in the IF70 group, i.e. those subjects who reduced their energy intake by 30% by intermittent fasting (lipids not shown in Figure 5) and hence, ultimately, to the claim from the headline of this article: “Intermittent Fasting Beats Isocaloric Continous Dieting” – an article that turned out to be more of a research update than the analysis of Hutchinson’s latest results. Figure 6: You can hardly argue that the real-world nutrient intakes (in g/d) in the IF70 group come close to what we know would be optimal for lean mass retention (Hutchinson 2018). I could continue this list forever, but instead of doing so, I will tell you this: If skipping breakfast “lean gains”-style allows you to effortlessly reduce your energy intake by 500kcal/day – do it! Don’t fret, though, if intermittent fasting just doesn’t seem to work for you even after you’ve given it enough time (2 weeks+) for your circadian rhythm to adjust. If there’s one thing we seem to be able to tell for sure it’s that the main driver of (intermittent fasting-induced) weight loss is the calorie deficit you’re generating – add heavy resistance training and sufficient protein 2g/kg to the mix and watch your progress in the mirror. Much better progress than the subjects in the Hutchinson study who didn’t skip breakfast, but reduced their energy intakes by 500kcal/d without either working out or eating close to sufficient amounts of protein (see data in Figure 5) | Leave a comment on Facebook! Antoni, Rona, et al. “Intermittent v. continuous energy restriction: differential effects on postprandial glucose and lipid metabolism following matched weight loss in overweight/obese participants.” British Journal of Nutrition 119.5 (2018a): 507-516. Antoni, Rona, et al. “A pilot feasibility study exploring the effects of a moderate time-restricted feeding intervention on energy intake, adiposity and metabolic physiology in free-living human subjects.” Journal of Nutritional Science 7 (2018b). Brinia, M. E., et al. “The effects of intermittent energy restriction on metabolic and cardiovascular function and overall health.” Arch. Hell. Med 35 (2018): 1-17. Ganesan, Kavitha, Yacob Habboush, and Senan Sultan. “Intermittent Fasting: The Choice for a Healthier Lifestyle.” Cureus 10.7 (2018). Harris, Leanne, et al. “Intermittent fasting interventions for treatment of overweight and obesity in adults: a systematic review and meta-analysis.” JBI database of systematic reviews and implementation reports 16.2 (2018): 507-547. Harvie, Michelle, et al. 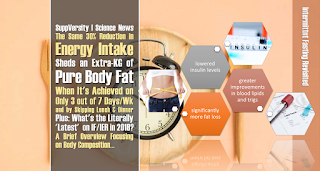 “The effect of intermittent energy and carbohydrate restriction v. daily energy restriction on weight loss and metabolic disease risk markers in overweight women.” British Journal of Nutrition 110.8 (2013): 1534-1547. Hector, Amy J., and Stuart M. Phillips. “Protein recommendations for weight loss in elite athletes: A focus on body composition and performance.” International journal of sport nutrition and exercise metabolism 28.2 (2018): 170-177. Hutchinson, et al. “” Obesity 27 (2019): 50-58. Ahead of print. Sainsbury, A., et al. “Rationale for novel intermittent dieting strategies to attenuate adaptive responses to energy restriction.” Obesity Reviews 19 (2018): 47-60. Schübel, Ruth, et al. “Effects of intermittent and continuous calorie restriction on body weight and metabolism over 50 wk: a randomized controlled trial.” The American journal of clinical nutrition 108.5 (2018): 933-945. Smith, Gordon I., et al. “Effect of Protein Supplementation During Diet‐Induced Weight Loss on Muscle Mass and Strength: A Randomized Controlled Study.” Obesity 26.5 (2018): 854-861. Sundfør, T. M., M. Svendsen, and S. Tonstad. “Effect of intermittent versus continuous energy restriction on weight loss, maintenance and cardiometabolic risk: A randomized 1-year trial.” Nutrition, Metabolism and Cardiovascular Diseases (2018). Trepanowski, John F., et al. “Effects of alternate-day fasting or daily calorie restriction on body composition, fat distribution, and circulating adipokines: secondary analysis of a randomized controlled trial.” Clinical Nutrition 37.6 (2018): 1871-1878. Varady, Krista A., et al. “Short-term modified alternate-day fasting: a novel dietary strategy for weight loss and cardioprotection in obese adults–.” The American journal of clinical nutrition 90.5 (2009): 1138-1143. Varady, Krista A., et al. “Alternate day fasting for weight loss in normal weight and overweight subjects: a randomized controlled trial.” Nutrition journal 12.1 (2013): 146.